The rose quartz is a storied, elegant gem whose name is derived from its charming pink color, reminiscent of rose petals. It represents unconditional love and compassion. It has been used as a talisman to attract love and heal heartache since 600 B.C.E. Ancient Romans and Egyptians prized the stone for its reputation as a youth restorer, and face masks made of the material have been found in Egyptian tombs. Classic Chinese carvings and engravings often featured this crystal from the earliest times. The rose quartz was also once known as the Silesian or Bohemian ruby. Larger stones usually have the richest color, and it is relatively uncommon to find a small rose quartz stone that has a strong hue. The gem may have inclusions that create a cat’s eye or a star effect. Gem carvers often use this pink crystal for figures or for decorative details. The rose quartz is available in translucent or transparent forms. The silicon dioxide crystal is one of the most commonly occurring types of quartz. Miners often discover it in the center of granite pegmatites in Madagascar, India, South Africa, Brazil, and South Dakota. The rose quartz’s unique hue is created by the combination of titanium, manganese, and iron. Its pink color is associated with the feminine aspect, and mystics throughout the ages have associated it with maternal or goddess energy. Crystal enthusiasts use the quartz to soothe sadness, loneliness, and to attract loving energy. Some recommend wearing the crystal close to the heart and say that the stone encourages the body to radiate loving energy. The crystal is sometimes recommended for breastfeeding mothers or for women who are about to give birth. People who have difficulties with self-acceptance and who want to open the heart chakra may wear the crystal close to their hearts. Claims have been made that rose quartz smooths out complexion and promotes a feeling of harmony and balance. Some crystal fanciers wash their faces with water that holds a rose quartz and report wrinkle reduction and a more youthful appearance. Popularly known as the “love stone,” the rose quartz is said to enhance relationships when it’s worn as a necklace or placed under a pillow. Some people have even created love shrines to display the crystal in close proximity to a photograph of a loved one. 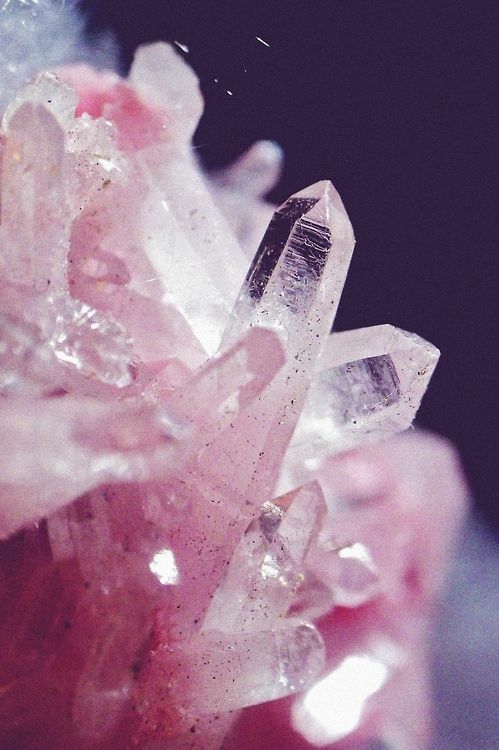 Mineralogists found a variation of the rose quartz in crystalline forms in the 1990s. These have now been placed in a separate category known as pink quartz. While some people purchase the two stones interchangeably, those who are concerned with the mystical or symbolic significance of the stones should pay attention to the distinctions between the two varieties. The rose quartz is associated with the fifth wedding anniversary. It is also the birthstone of the astrological sign Taurus, and jewelry made from the gemstone is a popular birthday gift. Actress Kate Hudson, a crystal enthusiast, proudly wears a rose quartz heart necklace given to her by her famous mother, Goldie Hawn. Make a sensation with your own rose quartz piece. Stop into Diamonds Forever in San Diego to browse through our selection.